A thorough cryotherapy treatment causes basement membrane separation, which may result in blister formation. Various methods have been devised in the use of cryotherapy of lesions. They include the spray freeze technique, the applicator technique, the cryoprobe method, and the thermo-coupler method. Liquid nitrogen is the best and universal freezing source because of its low boiling point and its ease of use. Other sources that are used to freeze, such as Freon, carbon dioxide, and nitrous oxide, do exist, but they are not as efficient in destroying lesions because of their higher boiling points. Prior to freezing the lesion, the patient must be informed of the procedure, and verbal or written consent must be obtained. A local anesthetic, such as 1% lidocaine, or a topical anesthetic, such as ELA-Max (Ferndale Pharmaceuticals) or EMLA (Astra Pharmaceuticals), can be used. Young children almost always need some type of anesthetic prior to treatment. Debulking keratotic material with a razor, a No. 11 blade, or a curette by shaving or by curettage facilitates the destruction. The spray cryotherapy technique is probably the most commonly used method. This method is suitable for most benign and some superficial neoplastic lesions. Pulsing each spray to avoid an overexpansion of the treatment site prevents complications. A cone spray technique, as shown in the image below, has been suggested in the past by using an apparatus with 2 open ends; however, such accessories are not readily available and, thus, they are not often used. The cone attachments are round; therefore, they are most suitable for round lesions. For large, irregularly shaped lesions, sequential freezing is necessary. Photo taken prior to spraying of the lesion by using the cone technique. To concentrate the freezing and to prevent disease communication (especially in this era of conditions such as HIV disease or hepatitis), disposable cones can be used to concentrate the liquid nitrogen. 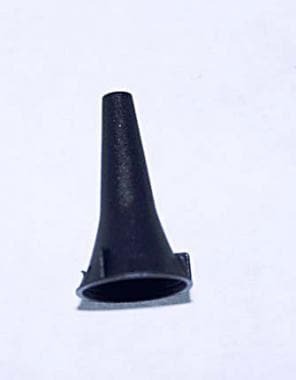 This disposable otoscope specula can be trimmed to make the aperture larger, or an angle can be cut to make a fusiform shape for oval lesions. Disposable specula come in a variety of sizes, ranging from 2.5-9 mm. 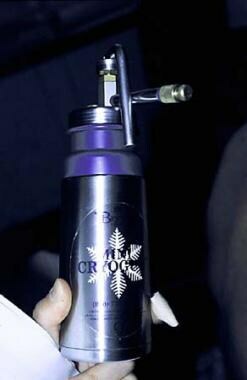 The nozzle tip of the spray gun is held about 1 cm from the treatment site, and liquid nitrogen is sprayed on the lesion until an ice ball is formed. The operator then palpates the lesion to determine the size of the ice ball created. This process is repeated until an ice ball of the desired size is created. The time for which the lesion is frozen is the freeze time. This freeze-thaw cycle can be repeated, depending on the type of lesion being treated. Hypopigmentation is a common complication with cryotherapy. This complication is due to the temperature-sensitive melanocytes, which die at the relatively high temperature of -5°C to -10°C. Feathering, the process of gradually and lightly freezing the area surrounding the ice ball to prevent an abrupt edge, can provide better cosmetic results. The most common applicator device is the spray gun. This vacuum bottle holds liquid nitrogen and releases the liquid with reasonable accuracy. 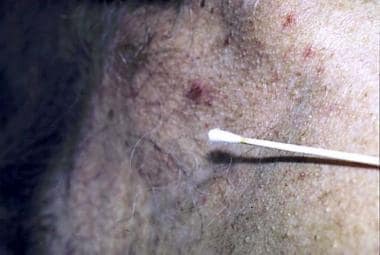 The dipstick applicator method, as shown in the image below, is the original method used to apply liquid nitrogen to lesions. A cotton-tipped applicator is dipped into liquid nitrogen from a polystyrene cup. The dipstick applicator is then firmly pressed against the lesion for the desired duration. 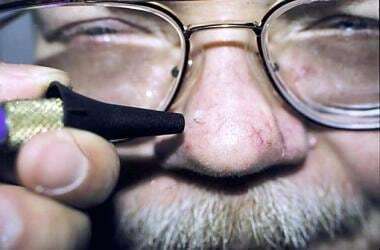 Low temperatures are not achieved in the dipstick applicator method as they are in the spray technique; therefore, this method is suitable only for benign lesions. A cotton-tipped applicator is another method used to treat benign lesions. Adenovirus is capable of survival in liquid nitrogen; therefore, the same source of liquid nitrogen should not be used with different patients. Previously unused liquid nitrogen can be placed in a polystyrene cup and then promptly discarded after use for a single patient. Manufacturers have devised various metal attachments to serve as heat-conducting probes for cryotherapy. Copper, because of its high conductivity, is typically used. A thin film of white petrolatum can be applied to the treatment site, and the cold probe is firmly pressed against the lesion. Many practitioners do not use the probe because it is cumbersome and time consuming. To treat malignant lesions, a temperature probe coupled to a digital thermometer that can read to -75°C can be used. Local anesthetic is injected into the lesion, and a temperature probe is inserted into the estimated depth of the lesion. Usually, a metal or styrene cone is used to concentrate the freeze. The liquid nitrogen is sprayed into the cone until the desired temperature is reached, usually -50°C to -60°C. This process can be repeated until the desired destruction is achieved. Forceps or clamps can be used to concentrate the freeze and to prevent collateral damage. A clamp is being used during the freezing treatment shown below. Usually, 2 freeze applications of 15 seconds are required. As with any procedure, complications can occur. Complications can be divided into (1) acute, (2) delayed, (3) prolonged-temporary, and (4) permanent. Acute complications include headache, pain, and blister formation. Delayed complications include hemorrhage, infection, and excessive granulation tissue formation. Prolonged-temporary complications include milia, hyperpigmentation, and change in sensation. Permanent complications include alopecia, atrophy, keloids, scarring, hypopigmentation, and ectropion formation. Contraindications can be divided into 2 groups: relative contraindications and absolute contraindications. Relative contraindications include cold intolerance, cold urticaria, cryoglobulinemia, history of pyoderma gangrenosum, and Raynaud disease. Absolute contraindications include the use of cryotherapy near the eye margins. Cryotherapy is a safe and easy to use treatment to destroy many benign and malignant lesions. The cryotherapy operator must be aware of the complications associated with this modality; for example, a complication is hypopigmentation (dark-skinned individuals are prone to hypopigmentation). One needs to be aware of the fact that lesions may need to be treated multiple times before resolution. Cooper IS, Lee AS. Cryostatic congelation: a system for producing a limited, controlled region of cooling or freezing of biologic tissues. J Nerv Ment Dis. 1961 Sep. 133:259-63. [Medline]. Freiman A, Bouganim N. History of cryotherapy. Dermatol Online J. 2005 Aug 1. 11(2):9. [Medline]. Menesi W, Buchel EW, Hayakawa TJ. A reliable frozen section technique for basal cell carcinomas of the head and neck. Can J Plast Surg. 2014 Fall. 22(3):179-82. [Medline]. [Full Text]. Kuflik EG, Gage AA. The five-year cure rate achieved by cryosurgery for skin cancer. J Am Acad Dermatol. 1991 Jun. 24(6 Pt 1):1002-4. [Medline]. Guan H, Zhao Z, He F, et al. The effects of different thawing temperatures on morphology and collagen metabolism of -20 degrees C dealt normal human fibroblast. Cryobiology. 2007 Aug. 55(1):52-9. [Medline]. van Leeuwen MC, Bulstra AE, van Leeuwen PA, Niessen FB. A new argon gas-based device for the treatment of keloid scars with the use of intralesional cryotherapy. J Plast Reconstr Aesthet Surg. 2014 Aug 27. [Medline]. Torre D. Cryosurgical treatment of epitheliomas using the cone-spray technique. J Dermatol Surg Oncol. 1977 Jul-Aug. 3(4):432-6. [Medline]. Kuwahara RT, Rasberry RD, Amonette RA. Use of disposable otoscope specula in cryotherapy. Dermatol Surg. 2000 May. 26(5):493-4. [Medline]. Orengo I, Salasche SJ. Surgical pearl: the cotton-tipped applicator--the ever-ready, multipurpose superstar. J Am Acad Dermatol. 1994 Oct. 31(4):658-60. [Medline]. Firnhaber JM. Diagnosis and treatment of Basal cell and squamous cell carcinoma. Am Fam Physician. 2012 Jul 15. 86(2):161-8. [Medline]. Kuwahara RT, Huber JD, Ray SH. Surgical pearl: forceps method for freezing benign lesion. J Am Acad Dermatol. 2000 Aug. 43(2 Pt 1):306-7. [Medline]. Adeniran AJ, Prieto VG, Chon S, Duvic M, Diwan AH. Atypical histologic and immunohistochemical findings in melanocytic nevi after liquid nitrogen cryotherapy. J Am Acad Dermatol. 2009 Aug. 61(2):341-5. [Medline]. Stavropoulou E, Korfitis C, Christofidou E, Tzilalis VD, Rallis E. Blue rubber bleb nevus syndrome successfully treated with polidocanol sclerotherapy and cryosurgery. Dermatol Surg. 2009 Sep. 35(9):1442-4. [Medline]. Zouboulis CC, Blume U, Buttner P, Orfanos CE. Outcomes of cryosurgery in keloids and hypertrophic scars. A prospective consecutive trial of case series. Arch Dermatol. 1993 Sep. 129(9):1146-51. [Medline]. Kempiak SJ, Lee PW, Pelle MT. Rhinophyma treated with cryosurgery. Dermatol Surg. 2009 Mar. 35(3):543-5. [Medline]. Lee AD, Jorizzo JL. Optimizing management of actinic keratosis and photodamaged skin: utilizing a stepwise approach. Cutis. 2009 Sep. 84(3):169-75. [Medline]. Berman B, Amini S. Pharmacotherapy of actinic keratosis: an update. Expert Opin Pharmacother. 2012 Sep. 13(13):1847-71. [Medline]. Keogh-Brown MR, Fordham RJ, Thomas KS, et al. To freeze or not to freeze: a cost-effectiveness analysis of wart treatment. Br J Dermatol. 2007 Apr. 156(4):687-92. [Medline]. Al-Mutairi N, Al-Doukhi A, Al-Farag S, Al-Haddad A. Comparative Study on the Efficacy, Safety, and Acceptability of Imiquimod 5% Cream versus Cryotherapy for Molluscum Contagiosum in Children. Pediatr Dermatol. 2009 Oct 4. [Medline]. Panagiotopoulos A, Chasapi V, Nikolaou V, et al. Assessment of cryotherapy for the treatment of verrucous epidermal naevi. Acta Derm Venereol. 2009. 89(3):292-4. [Medline]. Carneiro FP, Maia LB, Moraes MA, de Magalhães AV, Vianna LM, Zancanaro PC, et al. Lobomycosis: diagnosis and management of relapsed and multifocal lesions. Diagn Microbiol Infect Dis. 2009 Sep. 65(1):62-4. [Medline]. Coleman SR, Sachdeva K, Egbert BM, Preciado J, Allison J. Clinical efficacy of noninvasive cryolipolysis and its effects on peripheral nerves. Aesthetic Plast Surg. 2009 Jul. 33(4):482-8. [Medline]. Manstein D, Laubach H, Watanabe K, Farinelli W, Zurakowski D, Anderson RR. Selective cryolysis: a novel method of non-invasive fat removal. Lasers Surg Med. 2008 Nov. 40(9):595-604. [Medline]. Krueger N, Mai SV, Luebberding S, Sadick NS. Cryolipolysis for noninvasive body contouring: clinical efficacy and patient satisfaction. Clin Cosmet Investig Dermatol. 2014. 7:201-5. [Medline]. [Full Text]. Graham GF. Cryosurgery. Fitzpatrick's Dermatology in General Medicine. New York, NY: McGraw-Hill; 1999. 2980-7. News Whole-Body Cryotherapy a Hot New Treatment for Depression?